Can Lions on a Leash Help Save Endangered Big Cats? A leading tourism operator in Zambia is planning to suspend its “lion walks,” sparking new debate. Earlier this month, Lion Encounter Zambia announced that it has “agreed” to suspend its “lion walk” activities beginning in November 2015, a move which is being celebrated by wildlife activists in light of growing publicity linking similar activities to unethical lion breeders in the wider region, particularly in South Africa. Lion Encounter Zambia falls under the umbrella of the African Lion and Environmental Research Trust (ALERT). While ALERT itself is a not-for-profit organization, it manages three commercial operations: Lion Encounter Zambia in Livingstone, and Lion Encounter Victoria Falls and the original Antelope Park facility, both in Zimbabwe. All of these commercial ventures offer tourists the chance to have “close encounters” with lions, a lifelong dream for many visitors to Africa. Such encounters cost tourists roughly $130. Some pay up to a few thousand dollars to “volunteer” at one of ALERT’s commercial sites for a few weeks or so. All three ALERT sites attract huge numbers of visitors and volunteers per year, predominantly from Europe and, even more so, the United States. Ostensibly, it’s all in the name of conservation. But many conservationists have their doubts whether such programs are in the interest of the individual animals or the species as a whole. In the past few years there has been a growing chorus of voices against ALERT and in particular against its commercial ventures in Zimbabwe and Zambia. The criticisms are numerous and multi-faceted. First, lions at ALERT’s commercial facilities have been known to attack human visitors. In one incident ALERT’s founder Andrew Connelly had to kill a lioness that attacked a nine-year-old girl at Antelope Park. Some fear it is only a matter of time before a human fatality occurs. Second, a number of former visitors and volunteers and even employees claim to have witnessed ill-treatment and neglect of lions at ALERT’s commercial operations. A number of lions have died on ALERT’s watch, and some conservationists claim that these deaths could have been avoided. Third, and perhaps most importantly, many observers draw attention to the fact that 10 years since its inception, ALERT has failed to rehabilitate a single one of its lions into the wild from any of its facilities. Dr. Luke Hunter of the big cat conservation organization Panthera is skeptical. “The great nonsense behind schemes like ALERT’s is that they are simply unnecessary,” he has written. “If the objective is truly to restore lion populations, translocation of wild lions has over 20 years of experience showing it works, it is less expensive and it carries less risks for both lion and human than using captives”. If bad press (and the subsequent effect on funding) is among the main hindrances to ALERT’s lion conservation success, then the current furor around canned hunting in South Africa can’t be doing them any favors. In particular, an exposé by 60 Minutes late last year shed light on the unethical chain in which lions are bred in factory farms, stripped from the mothers at just a few weeks old to be used for cub petting and tourist interactions similar to those offered at Lion Encounter Zambia, then when they are considered too old and dangerous to interact with humans (and therefore no longer financially useful) they are sold on to canned hunting facilities to be shot like fish in a barrel by the highest bidder. Lion Park, which offers a range of animal encounters including cub petting, came off particularly badly, with the owner admitting that lions from the park had been sold into canned hunting within the last two years. Even after its battering by 60 Minutes Lion Park remains the number one tourist attraction in Gauteng Province, supported by glowing reviews and a “Certificate of Excellence” on Tripadvisor. Like ALERT, Lion Park also attracts a number of high-paying international volunteers eager to help care for young lions. 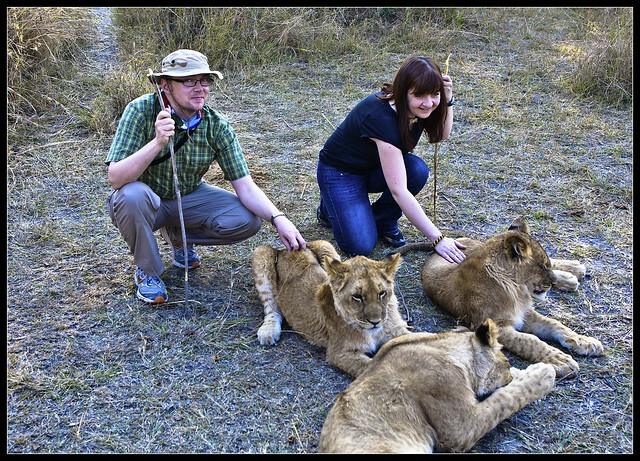 We can only assume that these volunteers remain ignorant as to where those lions will most likely end up. As with ALERT, Lion Park and a number of other similar operations in South Africa with links to canned hunting often seduce their volunteers with words like “conservation” or “sanctuary.” But is it really fair to group ALERT and notoriously unethical South African operators together in the same breath, as some critics are prone to? On the one hand, probably not. Canned hunting is illegal in Zambia (it remains legal in South Africa) and there is no conclusive evidence of any lions having been sold by ALERT since its operations began in 2005 (though Antelope Park did sell lions to South Africa in 1999). On the other hand, as the first and biggest operator of this type in Livingstone, ALERT’s Lion Encounter Zambia site has encouraged a handful of “copycat” operations with much less convincing conservation veneers and much more credible evidence suggesting they are mere money-making scams of the Lion Park ilk. For all the doubts and criticisms from the outside, my personal investigations have illustrated that a number of ALERT and Lion Encounter Zambia employees truly believe in what the Trust and its operations are trying to achieve. But anyone who has spent time with lions may well understand how the strong emotions these incredible creatures tend to inspire could cloud rational judgment. Either way, the impending suspension of lion walks at Lion Encounter Zambia should prompt further conversation about whether this ethically dubious activity can ever contribute to conservation, or if any such claims will always be, wittingly or unwittingly, a con. In the meantime, if you are planning on traveling to Southern Africa, avoid any doubt by choosing to spend your tourist dollars supporting Africa’s national parks and wild lions.